Fireworks, 2009: "Like Some Diamonds in the Sky..."
Greetings from Andi via the Critique Club. 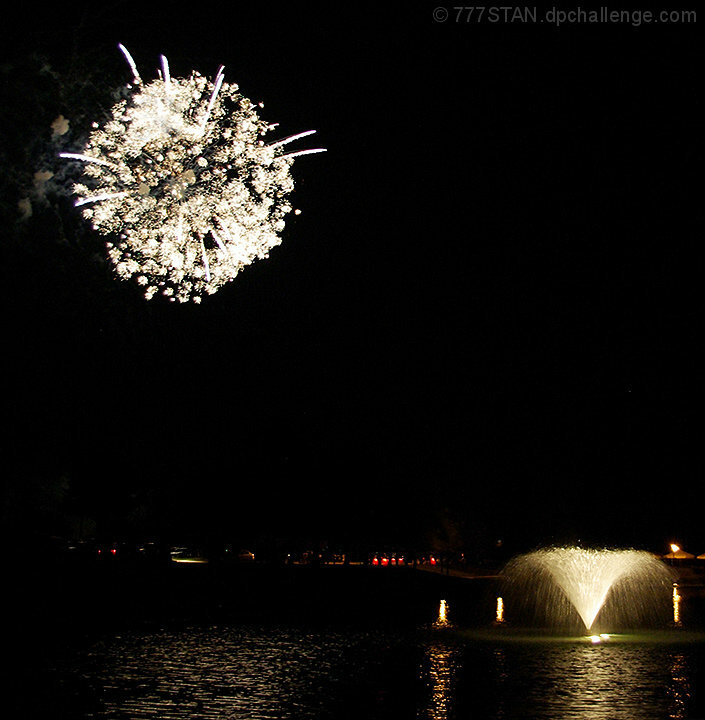 First Impression: Not sure about the fireworks being totally blown out, the horizon is a little off, I love the reflection in the water and the fountain. Subject:. Fireworks are something I've never tried to shoot but understand its a tricky subject and takes some planning to do well. For something like this to score well in a FS it has to be perfect. Technical: Intentional or not I don't care for the lack of detail/colour in the fireworks and whilst 1/10 sec exposed the foreground nicely maybe a graduated filter would have retained some detail in the fireworks? Final thoughts: I voted this a 5 during the challenge and would have given it at least a 6 if the image was straight and the fireworks were better exposed. That said, if you had cropped the fireworks out altogether I might have given you a 6 for the fountain. That has to be the prettiest fireworks burst I have ever seen. It reminds me of the wildflower Queen Anne's Lace. Proudly hosted by Sargasso Networks. Current Server Time: 04/26/2019 09:42:27 AM EDT.